Editor’s note: May is Preservation Month, and the National Trust for Historic Preservation encourages you to celebrate the important places in your community. Can creating equitable and sustainable communities through a people-centered preservation movement—as well as the other key concepts outlined in Preservation for People: A Vision for the Future—help you save the places that matter to you? Let us know what the future of preservation means to you: download the "This Place Matters" toolkit, and share your photos on social media with #ThisPlaceMatters. My interest in people-centered preservation started before I had ever heard the term “historic preservation.” In my last years as a history major at Clark Atlanta University, I found myself stuck. While history was my passion, I felt strongly that the classroom, which is where most of my cohort was headed, was not right for me. The question was, how could I teach history outside of a traditional classroom? My internship experiences at the Herndon Home Museum and the Hammond House Museum helped me begin to appreciate the significance of buildings and architecture as physical reminders of the social history of a neighborhood and a city. I came to understand that neighborhood preservation is not just a tool to save buildings or capture history: it can also ensure that known and unknown history makers and residents remain in and continue to be part of the neighborhoods that they helped create. For 13 years, I worked as a historic preservation planner and community engagement manager in Atlanta’s Department of City Planning. I saw the city prioritizing more equitable, healthy, resilient, vibrant, and sustainable communities, thus moving toward the people-centered preservation movement laid out in the National Trust for Historic Preservation’s “Preservation for People” vision document. The department and its Atlanta partners have undertaken a number of projects to that end. 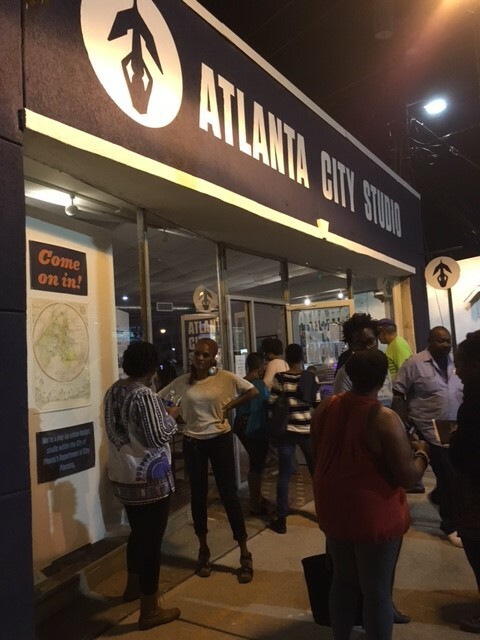 The Atlanta City Studio is a pop-up that engages diverse groups of residents in different parts of the city in urban design, historic preservation, and various Department of City Planning initiatives. Through events, listening sessions, workshops, and exhibits held at the studio, the public not only learns about citywide initiatives but also shapes them through participation. The pop-up’s first location was Ponce City Market, a former Sears, Roebuck and Company building that had been renovated using historic tax credits. 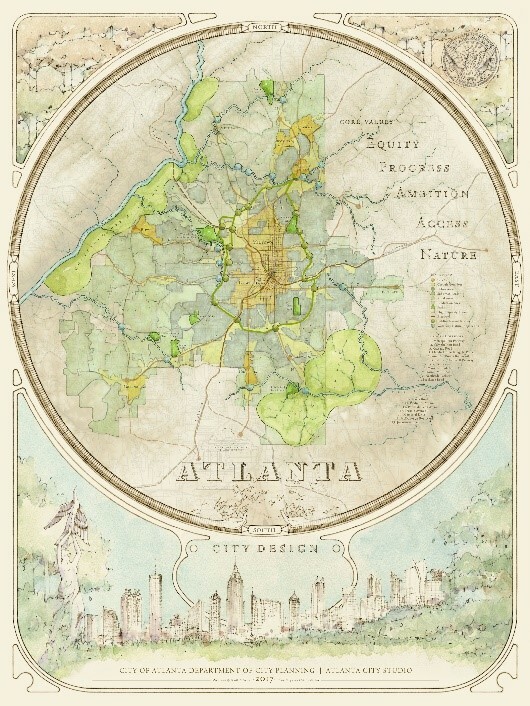 While there, the studio concentrated on citywide initiatives, including Atlanta City Design. 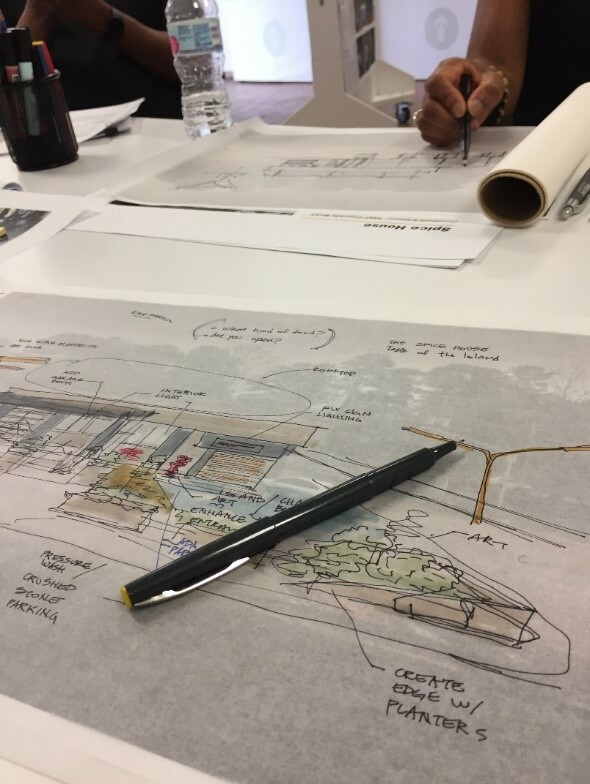 Now at its second location in the Cascade area of Southwest Atlanta, the pop-up is seeking to implement the design vision on a neighborhood scale. Cascade is a majority African American community whose residents face the threat of displacement; by locating the studio there, the department intends to address a community that has frequently been underrepresented. After months of collaboration with the community, other city departments, and stakeholders, the department is advancing a number of projects and programs, including historic preservation and transportation forums, an oral history project, tactical urbanism proposals, grants and design assistance for businesses, a two-day festival to help activate the street and vacant storefronts and a collaboration with Atlanta Public Schools to incorporate Atlanta City Design into the 8th grade curriculum. The National Trust’s “Preservation for People” vision document advises “pilot[ing] projects to demonstrate the critical role of older and historic places in sustaining our cities” and “encourag[ing] historic sites to engage the public in contemporary issues and contribute to livability, creativity, new understandings, and social cohesion”—both of which the Atlanta City Studio seeks to do. Engaging the public has also been the focus of a recent development in Atlanta’s historic preservation awards. For more than 40 years, the Atlanta Urban Design Commission—part of the Department of City Planning—has held an annual “Awards of Excellence” program to honor projects, programs, individuals, and organizations that significantly contribute to the enhancement of the city’s built environment, the preservation of its physical heritage, and the balance between the old and new. While anyone can submit a nomination, in practice it is mostly preservation professionals, architects, planners, and related firms that do so—and the same groups ultimately attend the awards ceremony. For years the commission has been trying to attract nominators, nominations, and award recipients that are more representative of Atlanta’s diverse people and projects. Inspired by a PastForward 2016 TrustLive presentation about “The Art of Relevance” by Nina Simon, the department’s historic preservation staff have added the new Community Design Awards. The main qualification for nomination is that the building, event, person, project, or artwork makes the community a better place to live. Unlike the Urban Design Commission’s awards, the Community Design Awards are nominated and decided by community members. Further, the application is simplified, and technical assistance is available to anyone who needs help creating or submitting a nomination. One of the first Community Design Award winners was a recently installed soccer field at the Five Points subway station in downtown Atlanta. Turning a previously underused urban space into a soccer field will serve all the children of Atlanta—no matter where they live—as part of the new "Soccer in the Streets" initiative. This project seeks to transform the lives of Atlanta youth through access to one of most popular sports in the world and hopes to serve a prototype for transit station reuse in cities all over the United States. The historic preservation ordinance that regulates the 21 historic districts and 60 individual historic buildings in the city of Atlanta has not been updated since the 1980s. The forthcoming Historic Revitalization Strategy will update that ordinance and thus determine the future of preservation in the city. The strategy will be centered around the “Story of Atlanta,” an engaging, multimedia-based narrative that will present the city’s history and identify significant themes in its development. That story will be used to build public support for the protection and revitalization of the culturally significant properties that best exemplify the city’s rich, unique, and often complex history. The process will engage nontraditional historic preservation partners, consider new preservation practices, and include communities and resources that have not previously been included in historic preservation studies and outreach. If it is fully realized, the Historic Revitalization Strategy has the potential to, per “Preservation for the People,” “honor... the full diversity of the ever-evolving American story” while “creat[ing] and nurtur[ing] more equitable, healthy, resilient, vibrant, and sustainable communities.” Implementing the strategy and the Atlanta City Design could make the city a model for a people-centered preservation movement. Leslie Canaan is a senior field officer in the Atlanta office of the National Trust for Historic Preservation.